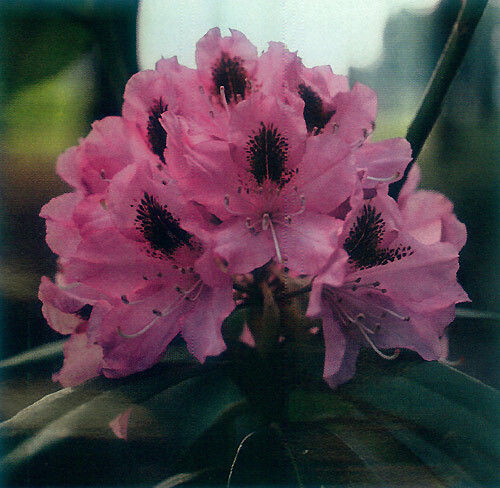 In the minds of most people, rhododendron gardens of note are associated with the East Coast and West Coast. The very large territory in between is usually considered to be so unfriendly to the culture of rhododendrons that persons on the lush east and west borders of the country have difficulty imagining that such gardens actually can flourish here. In spite of extreme temperatures, desiccating prairie winds, inappropriate soil conditions, and often inadequate rainfall, serious rhododendron growers have demonstrated that many varieties can thrive in the heartland. Splendid gardens, while perhaps somewhat less luxuriant than those of western and eastern growers, can be found from Wisconsin through Illinois, Indiana, and into Oklahoma and Arkansas. In this article, only the territory encompassed by the Midwest, Great Rivers and Ozark chapters will be sampled. 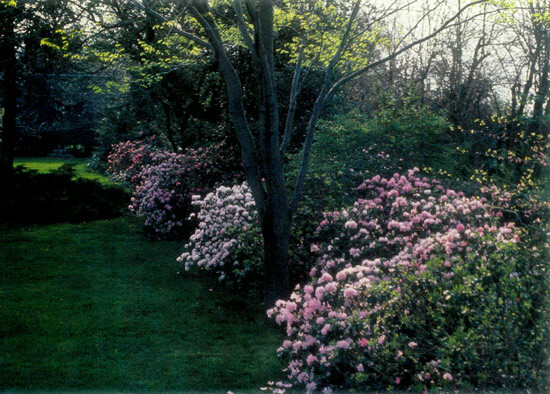 The Great Lakes Chapter area, representing a somewhat different climate because of the effect of the Great Lakes on temperature and moisture, is already known among ARS members to be compatible with rhododendrons. Evidence that the soil and climate can be dealt with for rhododendron culture is demonstrated each year at the Chicago Botanical Garden when Midwest Chapter members exhibit their trusses at a late May show. A typical display includes trusses of 80 to 100 large-leafed rhododendrons and deciduous azaleas which have been grown by members in southern Wisconsin and northern Illinois. The gardens from which they come are numerous and attractive. The gardens of Don and Mary Zaun in Wasco, Ill., and Kay Moats in Mt. Prospect, Ill., - both relatively close to Chicago and benefiting some from the moderating influence of Lake Michigan - demonstrate what many years of gardening skill can accomplish. The Zaun garden, which the owners have cultivated for over 40 years, occupies four acres. It takes advantage of original oaks, plus pine and sheared Canadian Hemlock, arranged to provide not only a windbreak but also an attractive setting for the rhododendrons and azaleas. The front garden is more formal and features azaleas. The early plantings were Ghents, but when Exburys became available, Don found them also to be well adapted to local conditions. To the rear of the house the landscape is terraced down to a man-made lake, and the setting is more naturalistic. Here there are many varieties of rhododendrons, planted among other broadleaf evergreens, including holly, Korean boxwood, kalmia and leucothoe, with dogwood and sourwood trees interspersed. It is not surprising that the rhododendrons that are most dependable in blooming are the PJM group and 'Olga Mezitt', but many other plants do well. Interestingly, Don reports that many of his ericaceous plants have been grown from seed. The garden Kay Moats has designed and developed over a 27-year span is situated on a one-fourth acre suburban lot and features an extensive collection of all types of rhododendrons and azaleas as the dominant plant in an array of the many others that she cultivates as companion plants. She places heavy emphasis on fall colors in her selections and has found 'Tunis', a deciduous azalea, and 'Boudoir', an evergreen variety, especially good for this. Other varieties she recommends for the area include 'Jolie Madame', 'Corringe', 'Homebush' and the Kurumes. The garden includes excellent specimens of daylilies, Siberian iris, climbing honeysuckle and daffodils, along with impressive dawn redwoods and beech trees, Japanese maples, dogwoods, baby serviceberry and many more. A gazebo at the lower end of the garden adds interest to the peaceful setting. Kay is a gardener with broad interests and a skilled eye for landscape design, who continues to move plants about as she determines more suitable locations, both for plant adaptation and for esthetic effect. 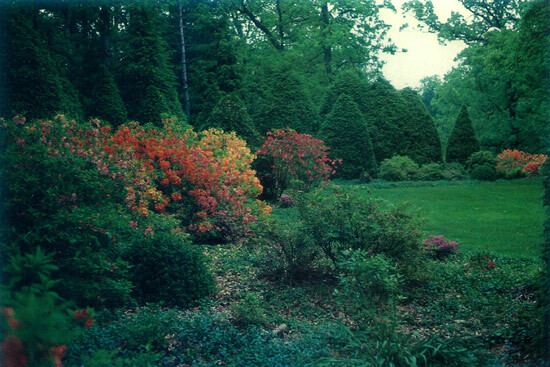 The one-half acre wooded city lot of George Gray in Williams Bay, Wis., extends the range of rhododendron culture in Midwest gardens northward. 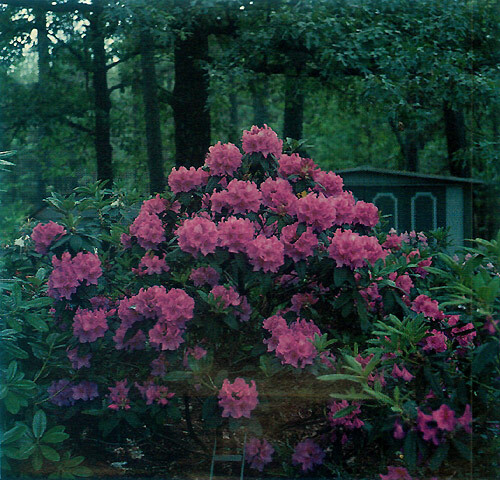 He started growing rhododendrons in 1974 and soon became addicted. There is a small stream running through his property with a picturesque footbridge. His collection of hardy plants is impressive and supports a hybridizing goal to develop a low growing elepidote with yellow or multicolored flowers. Each year, 12 to 15 crosses result in roughly 750 seedlings. One of these has been a reasonably hardy yellow that George calls 'Eden'*. It is the result of using R. wardii , R. dichroanthum and hardy R. fortunei . George observes that winter winds and temperatures that may drop 50 degrees Fahrenheit in 12 hours are perhaps the most serious problems in his area. In this climate, 'Trinity', 'Pink Icing'* hardy R. fortunei , 'Party Pink' and 'Besse Howells' seem to do well along with lepidotes such as 'Olga Mezitt', 'Faisia'*, 'Frosty Pink'* and others. He also observes that the Midwest has an advantage in being relatively free of serious insect and disease problems. An occasional insecticide spraying controls weevils. Dieback and root rot occur only during very overheated summers and can be controlled by a fungicide. PJM g., R. carolinianum x R. dauricum and 'Olga Mezitt'. 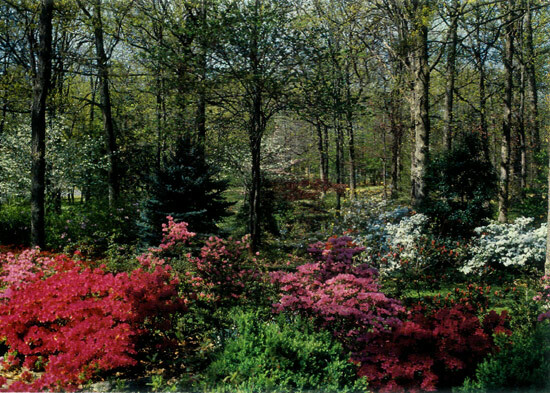 Further south in the Midwest district the rhododendron garden of Don and Elaine Paden provides an interesting note of variety in the typical flat central Illinois landscape. In this area rhododendron plants and flowers are not commonly seen, but they can be eye catching and rewarding year round. It goes without saying that here, too, the weather is daunting - temperatures can range between -25 and 107 degrees Fahrenheit - and is often fickle, so each season may provide new surprises - or disappointments. In the summer the temperature can remain above 90 degrees Fahrenheit for several weeks without rain. Snow, which usually provides winter cover in the northern range of District 11, is not frequent or heavy in central Illinois, if indeed it falls at all. In this location, winds are also a real problem, and it is vital to take advantage of any natural or created windbreaks. Along the south side of the Paden's three-quarter acre lot is a line of Osage orange trees that once served as an enclosure for a pasture and were the only wind protection when the first rhododendrons were planted in the 1950s. Thus, the present garden features a 300-foot border, now backed by hemlocks and an uncut Korean box hedge. Among the most rewarding of the several hundred plants in the garden are several varieties and crosses of R. yakushimanum , including 'Pink Parasol' and R. yakushimanum x R. smirnowii . This last hybrid bloomed in the spring of 1991 in spite of the extensive damage to flower buds on other large-leafed plants. It is a fairly low growing, charming plant even when not in flower. Many other broad-leafed plants have prospered, including a 15-foot English box, a 25-foot American holly and an 8-foot Ilex pedunculosa . This last holly (sometimes listed in catalogues as "Lone Stalked Holly") is unlike the usual run of hollies in that the bright red berries look like very small fruit from a cherry tree, with long stems. The Great Rivers Chapter encompasses Indiana, Kentucky, Southern Illinois, and Missouri. Holly does well in this area, and members usually feature it in their gardens along with the rhododendrons and azaleas. Usually the chapter plans a joint meeting each year with the American Holly Society. Lloyd and Helen Hahn's garden in Evansville, lnd., is located on a rolling hillside stretching down to a creek dammed up to become a picturesque lake which also provides irrigation. Heavy clay soil is a basic problem, with which the Hahns deal by using composted leaves and woodchips. The rhododendrons are planted with only about 50 percent of the root ball below the original surface. The pH is 7.6, so ferrous sulphate and sulphur must be used every year. Massed plantings of azaleas of one color in a single area enhance the landscape. The Hahn's favorite plant is 'Scintillation' AE. Helen remembers that in 1988 she deadheaded over 600 trusses from their largest plant of 'Scintillation'. They also report having good results with 'Ponticum Roseum' (syn. 'Maximum Roseum'). Kurume, 'Coral Bells' and 'Festive' azaleas. The newest addition to District 11 is the Ozark Chapter. Dr. Leonard Miller, president of the chapter, has a 3-acre garden in Grove, Okla., started in 1972. He has over a thousand azaleas and 130 rhododendron. He reports that 'Scintillation' AE also seems to be the best plant in this area. Lath fence is used to provide a measure of protection from the wind and sun which are problems for local growers. He also benefits from an above ground mist watering system. Miller uses only pine bark for planting because it reduces drying out and has disease reducing properties. Sue and Brad Mohr have had great success in their garden in Clinton, Ark., located at a favorable elevation of about 1,600 feet. Tall pines and oaks provide shade, and dogwood, ferns, hostas, as well as other plants, are interspersed with the rhododendrons and azaleas. Again, the heavy clay soil is a major problem, but by using some top soil mixed with rotted pine needles, oak leaves, rotted cow manure, and composted grass clippings piled to a level of about 12 inches, they successfully grow about 95 rhododendrons and 300 azaleas, including 25 varieties of deciduous azaleas. Because the temperature goes below zero almost every year, their selections are hardy varieties, including Gable, Girard, Shammarello, Schroeder, Kurume and Kehr hybrids. Many, many other gardens flourish in Middle America. It is regrettable that more could not be included in this short article, but hopefully these descriptions will show our ARS friends who have never visited the area that it is not a rhododendron wasteland. Growers in these states must maintain a large amount of tenacity, endure many frustrations and disappointments, and be willing to experiment, but all will agree that their gardens have been worth the effort. The author wishes to acknowledge help from the owners of the gardens in preparing the descriptions and also from Roger Dunlap, editor of the newsletter of the Midwest Chapter. Although we have visited these gardens in the Midwest and Great Rivers chapters several times, I have depended on members of the Ozark Chapter for all of the information about their gardens. It is regrettable that the limitations of space prevented inclusion of more of the many delightful gardens in the three chapters. Don Paden, a frequent contributor to the Journal, wrote on European gardens in the summer 1991 issue of the Journal. He is a member of the Midwest Chapter. Editor's Note: * designates an unregistered hybrid. The name does not conflict with that of a registered clone.